In this chapter, I have put all varieties of this issue.In same cases these varieties were obtained to satisfy speculative demands of philatelists, in same cases they born by mistakes. The varities obtained in the issue of Brescia, were, usually, made by mistakes of printing machine worker, while, in the issue of Verona, some overprints were made not accidentally. This picture shows some stamps of Verona's issue, printed with double overprint. Only a sheet of 100 stamps per type was overprinted with this variety, so I think this is a non-speculative overprint.They are very scarce. Very scarce is the stamp above showed, It is a double inverted overprint belonging to Verona's issue. Only 100 stamps were overprinted. The most important variety of Brescia's issue is showed above. After the letter N, there is a comma instead a dot. This remarkable and scarce variety, was obtained for a oversight of the worker that confused the letters. This rarity occupied position # 69 of the only three proof sheets of this issue, but not all stamps belonging of this set had this variety. In the succeeding overprints, the comma was chiselled, obtaining a shapeless dot. After many overprints, the dot missed. this varieties are not to be found on philatelic exchange. This picture shows the comma chiselled ( position # 69 ). During overprinting operations of the issue of Brescia, on the position # 86 of the printing plate, the fixing screw of the letter R loosen, so the character shifted toward the letter N. All stamps of this set are known with this amazing variety. Two blocks with overprint shifted toward left ( Issue of Brescia ). 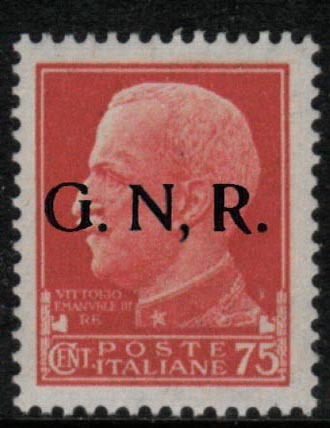 Some sheet of the issue of Brescia, were overprinted with a nice variety on position # 10 : the letter R without dot. Above are the positions 9 and 10, the item on right have not a dot after R.
The letter R in the stamps above is broken on the upper left angle, this variety occupied the position # 168 ( the position 68 of the second sheet). Very amazing is the variety showed in the stamps on right. The letter R is rotated counterclockwise. This occurred because the fixing screw of the letter R, loosen.